Home » asylum of the daleks , bbc , doctor who , science fiction , television » "Asylum of the Daleks": Season premiere of DOCTOR WHO is certifiably insanely good! "Asylum of the Daleks": Season premiere of DOCTOR WHO is certifiably insanely good! Is it just me, or has Doctor Who suddenly become a bigger presence in American pop culture than ever before? Every Barnes & Noble I've been into lately has an entire table devoted to Doctor Who books and other merchandise. Matt Smith as the Eleventh Doctor was on the cover of Entertainment Weekly earlier this summer. A friend in Roanoke spotted a comic book store this past week: the marquee outside said "TALKING ABOUT REGENERATION" to advertise Doctor Who stuff inside. I've been watching Doctor Who since the winter of 1981. But in more than thirty years I've never seen the Doctor and his mythology as wildly popular on this side of the pond as it is now. "Asylum of the Daleks" opens with a sweeping and frightening vista of a place we haven't seen in a very long time: Skaro, the original home world of the Daleks. 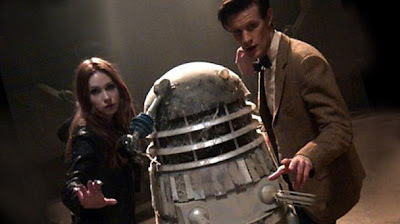 In quick fashion we witness the Doctor (Matt Smith) - still believed dead by the universe at large - along with Amy and Rory (Karen Gillan and Arthur Darvill) abducted by human agents of the Daleks and brought to what might be the most horrifying place we've seen yet in Doctor Who history: the Parliament of the Daleks. Yes folks, seems that even the Daleks have politicians. And right when you'd think that they are ready to at last exterminate their oldest and greatest nemesis, they screech out a frantic plea: "Save us." It's a prelude to what is doubtless an even more horrifying location: the Asylum. A cordoned-off planet containing millions of insane Daleks: the absolute worst and most uncontrollable of the most evil alien race in all the universe. And now it looks like the inmates are going to break loose. Like I said, if "Asylum of the Daleks" is any indication, this season is going to be in-tense. I'm going to give "Asylum of the Daleks" Four and 1/2 Sonic Screwdrivers out of a possible five. And next time on Doctor Who: "Dinosaurs on a Spaceship"!